Grade 7 Math Worksheets Quiz Videos - Online Tutor Pakistan, Online Tuition Karachi Pakistan, +92332-3343253 Skype id: ascc576, Online tuition Tutors Pakistan, Saudi Arabia ,Online Tutor Academy Pakistan Qatar, Kuwait, Saudi Arabia, USA, UK, Canada, Australia, Karachi Lahore Islamabad, Online Maths Physics Stats Tutor Karachi Pakistan, Online Tuition Pakistan,Online Tuition Pakistan, Online tuition in Karachi, Pakistani tutors, online tutors in Pakistan, Karachi tutoring, Online tutoring, Online math tutor Pakistan, Online Physics Tutor Pakistan, Online Teacher Pakistan, Online Chemistry Tutor Pakistan, Online Biology Tutor Pakistan, Online Economics Tutor Pakistan, Online tutor Accounts Pakistan. 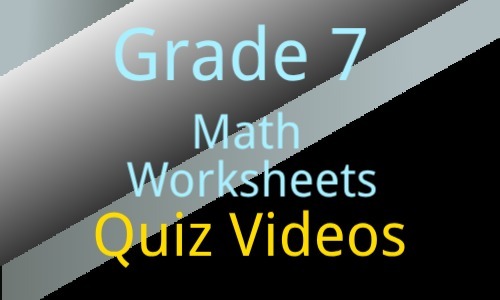 Grade 7 Math Worksheets Quiz Videos, ASVA offers complete and comprehensive math help for Grade 7 students, worksheets, quiz, past papers and videos. Online Tutor Pakistan has a well experienced, highly educated math faculty. Our dedicated tutors and professors are preparing these worksheets, videos, quiz etc with dedication.